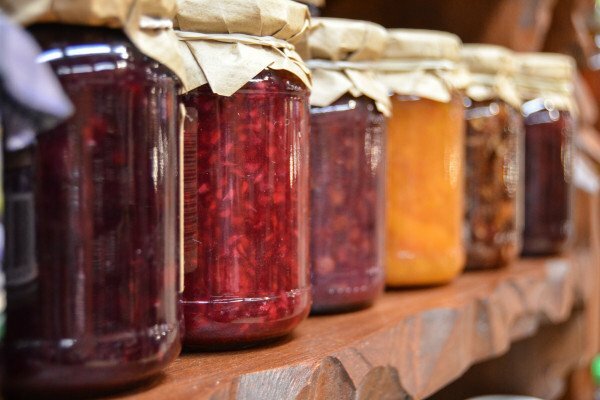 What makes jam set, or not? I make jam at home, and the recipes I use are always very specific about the amount of sugar and fruit to be combined with the pectin. While attempting to make jam a few weeks ago, I was short 1/2 a cup of fruit, but decided to go for it anyways. Unfortunately, it never set, and is more of a peach sauce than a jam. Why is this? Victoria - It depends on what fruits you're using. Different fruits have different amounts of pectin in them and the whole chemistry of jam making is all about making this pectin that's in the fruit break down and become water soluble. That then recombines, and all of those hydrogen bonds that are holding it together recombine in a chemical reaction with the fruit acid and with the sugar, and that makes a lovely network that forms a gel, and that's the kind of jelly-like substance of jams. Chris - What does the pectin do that enables that to happen? Victoria - The pectin actually is the backbone of this structure so that it holds together. It's a long chain carbohydrate, a polysaccharide. It's these long, interlinked, connected chains held together by hydrogen bonds that gives the fruit its rigidity and it will give your jam that gel-like semi-rigidity. But you need to break it down so that it's not too stiff. If you have too much pectin then it will recombine in this really, really solid sticky thick form, so you have too much pectin. And if you don't have enough of it or you haven't boiled it for long enough, or you haven't got the balance right to achieve that chemical reaction, you get this flimsy structure within your gel. It's basically a lattice structure that forms within your gel that will hold it down together nicely. So, it sounds like she's using commercial pectin as well, which is an extra cheat which you can use, but you do need to get those amounts quite right. There are other cheats you can use like you can re-boil up and throw in a bit more fruit acid, so it's just got a little bit more of that chemical reaction going. So you can fix it. Previous What is the temperature inside a black hole? Next Why don't Saturn's rings aggregate to form moons? Why does dried cereal stick to the bowl?